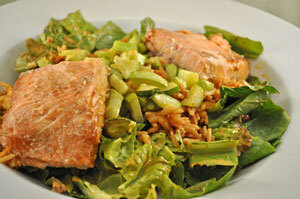 Salmon with Spanish Rice, Thyme for Cooking easy gourmet recipes. This will be the last lettuce salad of the season. You can either bake the salmon or cook it on the barbecue as we did. Mon mari always chooses the barbecue.... Simple Baked Tomatoes make it an easy, summer dinner to end the week. We use about half of the dressing with this salad; the rest on Sunday. These are meant to be warm, but not cooked... just enough to melt the cheese. 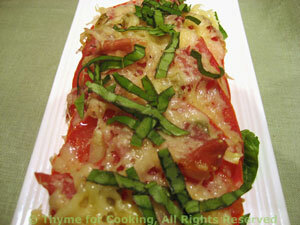 Slice tomatoes and lay, overlapping, but flat, in 1 large or 2 small baking dishes. Roughly chop or tear Prosciutto. Sprinkle tomatoes with chili powder, garlic, Prosciutto and cheese. Bake, 400F (200C) for 10 minutes. The cheese should be melted and the tomatoes warm, but not fully cooked. Remove, sprinkle with basil, drizzle with oil and vinegar and serve.